On my way to Venice for La Biennale I had all of 30 seconds to select my holiday read. 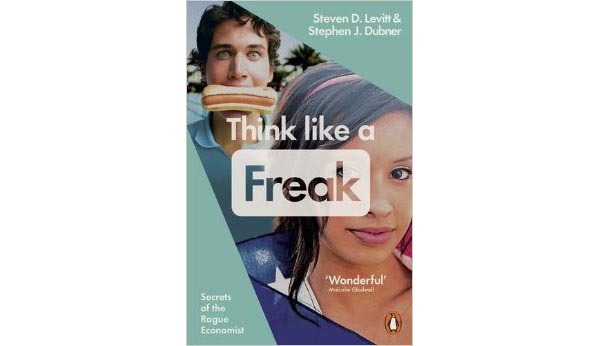 I picked Think like a Freak by Steven D. Levitt and Stephen J. Dubner because: a) I liked the title and b) I’d heard of Freakonomics (via my partner). In the style of the Star Wars movies, I was about to start the sequence backwards– see! I was thinking like a freak from the start. I’m not a fast reader but I had the book read in less than 6 days. It was a brilliant and funny read. I’m now telling anyone who will listen about it and suggesting they read it. My partner has almost finished reading it, and a friend who stopped with us for 3 days has completed it. Meanwhile I am off to grab my partner’s copy of Freakonomics.